Arthur K. Wheelock Jr., “Gerrit van Honthorst/The Concert/1623,” Dutch Paintings of the Seventeenth Century, NGA Online Editions, https://purl.org/nga/collection/artobject/163184 (accessed April 21, 2019). Gerrit van Honthorst (1592–1656) has long been considered one of the greatest painters of the Dutch Golden Age. After training in Utrecht, he traveled to Italy around 1615, where he embraced the radical stylistic and thematic ideas of Caravaggio. The immediacy of Caravaggio's religious and genre scenes, which are characterized by dramatic gestures and pronounced contrasts of light and dark, inspired a generation of "Caravaggisti" throughout Europe. These artists generally worked directly from posed models, as Caravaggio did, and brought their scenes close to the picture plane to suggest that they were an extension of everyday experiences. Honthorst, in particular, painted with verve and assurance, utilizing bright colors and strong chiaroscuro effects, and his life-sized sensuous figures dressed in exotic costumes gave a bold presence to his images. When Honthorst returned to Utrecht in 1620 he was already a famous artist, and he was feted in his native city. His enthusiastic embrace of Caravaggism and his international renown also had great appeal at the court of Prince Maurits of Nassau in The Hague. The Prince of Orange, as he was known, was consciously trying to broaden the reputation of the court by improving his residences, building gardens, presenting musical soirées, and acquiring paintings. Honthorst's The Concert is first mentioned in a 1632 inventory of one of the Prince of Orange’s palaces in The Hague. Although the painting may have been purchased by Maurits, it may also have been a diplomatic gift. Paintings were often given to the prince in appreciation for services rendered or in hopes of eliciting future favors. A possible source for such a diplomatic gift was the exiled king of Bohemia, Frederick I, who had moved to The Hague in 1621 with his wife, Elizabeth Stuart, after his Protestant troops were defeated by Catholic forces. Even in exile, the king and queen of Bohemia actively collected works of art and lived a sumptuous lifestyle with funds partially provided by the Prince of Orange. They were great admirers of Honthorst, and he eventually became their court artist. Frederick and Elizabeth may have commissioned the painting and then presented it to the Prince of Orange in appreciation for his financial support. This hypothesis is based on the similarity between the concertmaster in Honthorst’s painting and an illustration of Frederick playing ball in a contemporary manuscript depicting courtly life in The Hague. The Concert was much more than a decorative element in a courtly setting. It also had an underlying political message. Harmony in society, as well as in music, exists when the guidance of its leader is followed. This adage would have been appropriate for either the Prince of Orange or King Frederick I of Bohemia. Until recently, the influence of Caravaggio on the art of northern Europe had not been represented in the Gallery's otherwise rich collection of Dutch art. The acquisition in 2009 of Hendrick ter Brugghen's Bagpipe Player, 1624, was a first step in addressing this gap. Together with the Gallery's Italian, French, and Spanish Caravaggist paintings, the works by these two masters convey the enormous impact of Caravaggio's style throughout Europe in the 17th century. This gesture, meaning “silence,” is illustrated in: John Bulwer, Chirologia: or the Natural Language of the Hand and Chironomia: or the Art of Manual Rhetoric, London, 1644, rev. ed., ed. James W. Cleary, Carbondale, 1974, 143, fig. H. Two other smiling background figures at the far right add to the festive character of the scene. Among the artists in Rome most inspired by Caravaggio at this time were Bartolomeo Manfredi, Orazio Gentileschi, Carlo Saraceni, and Valentin de Boulogne. Like Caravaggio, these artists generally worked directly from models and brought their scenes close to the picture plane as though they were but an extension of the viewer’s world. They emphasized the momentary quality of their images through dramatic gestures and pronounced contrasts of light and dark. A. R. Peltzer , ed., Joachim von Sandrarts Academie der Bau-, Bild- und Mahlerey-Künste von 1675. Leben der berühmten Maler, Bildhauer und Baumeister, Munich, 1925, 303. Honthorst probably would have received the invitation to live at the Palazzo Giustiniani from Benedetto Giustiniani, whose extensive collection included a large number of works by Caravaggio and the Carracci, as well as by Raphael, Giorgioni, and Titian. After his death in 1621, Benedetto’s younger brother, Vincenzo (1564-1637), who also lived in the Palazzo, inherited the property. It seems that other northern artists lived in the Palazzo, which was located near the Church of San Luigi dei Francesi. When Honthorst returned to Utrecht in 1620 he was a famous man, and a celebratory feast in his honor welcomed him home. Despite Honthorst’s predilection in Rome for painting scenes with dramatic effects of light and dark, often by means of artificial light sources, The Concert is bright and airy. He has here fused Caravaggism and classicizing traditions to create an image appropriate for the artistic tastes and expectations of the Dutch Court in The Hague. Natural daylight falls evenly across the composition, illuminating the shimmering fabrics, flowing feathers, and smooth wooden musical instruments. It models the figures’ varied flesh tones, which range from the ruddy complexions of male performers to the women’s pale breasts and rosy cheeks. It creates realistic shadows, such as those on the music books under the concertmaster’s hand and bow that reinforce the significance of individual gestures and help enhance the sense of immediacy. Even with the repoussoir figure of the concertmaster, on whom light does not fall as strongly as on his companions, it accents the curls of his hair and brings out the sheen of his glistening wine-colored doublet. He would have seen this painting in the collection of Cardinal Francesco Maria del Monte. For example, the captivating shadow cast on the face of the instrument by the lute player’s right hand as she strums its strings is a pictorial effect he derived from Caravaggio’s The Lute Player, c. 1595–1596 [fig. 3] [fig. 3] Michelangelo Merisi da Caravaggio, The Lute Player, c. 1595–1596, oil on canvas, The State Hermitage Museum, Saint Petersburg. Photo © The State Hermitage Museum / Vladimir Terebenin, versions of which were in both the Cardinal del Monte and Giustiniani collections. Despite this thematic and stylistic similarity to Caravaggio’s early depictions of musicians, however, the visual impact of Honthorst’s painting is quite different. The reds, yellows, blues, greens, and lavender of the musicians’ brightly colored satins, some of which are festooned with ostrich feathers dyed to match, lend a remarkably festive air to this gathering. In part he derived this rich palette from other Caravaggisti working in Rome in the 1610s, among them Orazio Gentileschi (Florentine, 1563 - 1639), Simon Vouet (French, 1590 - 1649), and Lionello Spada (1576–1622). Spada’s The Concert, c. 1615 [fig. 4] [fig. 4] Leonello Spada, The Concert, c. 1615, oil on canvas, Musée du Louvre, Paris, inv. 681. Photo © RMN-Grand Palais / Art Resource, NY. 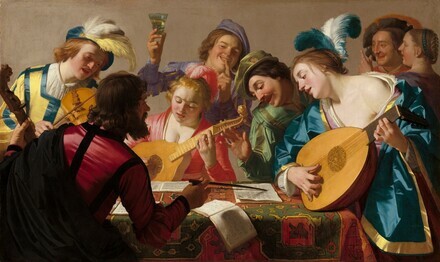 Photography by René-Gabriel Ojéda, moreover, includes various motifs that Honthorst effectively exploited in this painting, including the concertmaster using his bow to direct the musicians’ attention to notes in a musical score, and a boy looking out at the viewer while bringing his finger to his lips to encourage silence. For a discussion of this event, see J. Richard Judson & Rudolf E.O. Ekkart, Gerrit van Honthorst 1592–1656, Doornspijk, 1999, 14. See: Robert Hill, “Sir Dudley Carleton and his relations with Dutch artists 1616–1632,” in Dutch and Flemish artist in Britain 1550-1800, Leids Kunsthistorisch Jaarboek, 13, 2003, 255–274. Whatever the source of information, Carleton quickly concluded that Honthorst’s ability to work in Caravaggio’s revolutionary style would be welcome among English and Dutch courtiers who wanted to be au courant with international trends. See Onno Ydema, Carpets and their Datings in Netherlandish Paintings 1540–1700, Zutphen, 1991, exp. 41–48. I would like to thank Sumru Krody, Senior Curator at The George Washington University Museum and The Textile Museum, for identifying this carpet for me. I am also grateful for Rosamond Mack for sharing her observations of the carpet with me in a letter of December 20, 2013. She notes that the carpet “features a distinctive star with 4 spade-shaped lobes attached to the diagonals of the octagonal center.” It is a type that was developed commercially in the Ushak region of Ottoman Turkey during the late fifteenth and early sixteenth centuries. Honthorst’s design is roughly accurate, although the green color of the lobes is not otherwise known for such rugs. Generally the lobes are dark blue, and green plays only a minor role in the ornaments within the lobes or on the red grounds. Whether or not Honthorst varied the color palette of the carpet for compositional reasons is not known. Louis Peter Grijp’s comments are contained in an email he sent to the author on Nov. 20, 2014 (curatorial records). In the past, the painting listed in 1795 has been erroneously identified as The Concert, 1624, Musée du Louvre, in which only women and putti are depicted. See, for example, S. W. A. Drossaers and Th. H. Lunsingh Scheurleer, ed., Inventarissen van de inboedels in de verblijven van de Oranjes en daarmede gelijk te stellen stukken, 1567–1795, 3 vols., The Hague, 1974–1976, 1 (Inventarissen Nassau-Oranje, 1567-1712) (inventory no. GS147), 207, no. 611, note. See also J. Richard Judson & Rudolf E.O. Ekkart, Gerrit van Honthorst 1592-1656, Doornspijk, 1999, 207-208, no. 273. This mistaken identification is partly because Honthorst’s 1623 painting of The Concert was only rediscovered in 2009. “Een muziceerend Gezelschap, op doek.” S. W. A. Drossaers and Th. 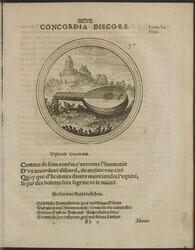 H. Lunsingh Scheurleer, ed., Inventarissen van de inboedels in de verblijven van de Oranjes en daarmede gelijk te stellen stukken, 1567–1795, 3 vols., The Hague, 1974–1976, 3 (Inventarissen Nassau-Oranje, 1763-1795) (inventory no. GS149), 216, no. 65. The word “Gezelschap” implies a mixed company of men and women. Louis Gourajod. “La Révolution et les Musées Nationaux, Part II” in Révue des questions historiques 24 (Paris, 1878) 203. “[Alexandre Lenoir] trouvait exorbitant que la hautaine administration du Musée [des Arts] … s’arrogeât le droit de lui enlever les meilleures de ses pacifiques conquêtes, et même les objets précédement refusés ou dédaignés par elle.” I would like to thank Henriette Rahusen for this reference. No further trace of The Concert exists until the 1840s, by which time it had entered a French private collection where it remained through the generations, unknown to scholars. The only visible trace of the painting is a watercolor made around 1900 by the painter Etienne Azambre (1859–1935), which depicts The Concert hanging in the grand salon of the family’s country estate [fig. 6] [fig. 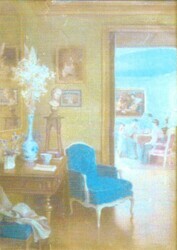 6] Etienne Azambre, Interior of a French Country Estate, c. 1900, watercolor, private collection. The reappearance of this masterpiece in 2009, one of the most remarkable discoveries in Dutch art in recent years, demonstrates that Honthorst’s stylistic and thematic innovations had an even greater impact among Dutch artistic circles in the early 1620s than had been previously realized. For the types, and political implications, of gifts that Maurits received, see Wouter Kloek, “Maurits en de beeldende kunst,” in Kees Zandvliet, Maurits Prins van Oranje, exh. cat., Rijksmuseum, Amsterdam, Zwolle, 2000, 147–150. Willem-Jan Hoogsteder, “De Schilderijen van Frederik and Elizabeth, Koning and Koningen van Bohemen,” Ph.D. diss., Kunsthistorisch Instituut der Rijks Universiteit te Utrecht, Utrecht, 1986, 99. In 1630, after he returned to the Netherlands, Honthorst became their court painter, and he continued to work for Elizabeth Stuart after Frederick’s untimely death in 1632. Before Frederick was elected king of Bohemia in 1619, he was Frederick V, Elector Palatine (1610–1623). In Vlissingen, the couple had been greeted by Prince Maurits, both because of family connections, but also because the marriage of Frederick, the Elector Palatine, and Elizabeth Stuart had created a political alliance that greatly strengthened the Protestant cause in central Europe. For Vroom’s painting, see Jeroen Giltaij and Jan Kelch, Praise of Ships and the Sea: The Dutch Marine Painters of the 17th Century, exh. cat., Museum Boijmans Van Beuningen Rotterdam, and Staatliche Museen zu Berlin, Gent, 1996, 86–89, no. 4; for those of Willaerts and Van Wieringen, see: George S. Keyes, Mirror of Empire: Dutch Marine Art of the Seventeenth Century, exh. cat., The Minneapolis Institute of Arts, The Toledo Museum of Art, Los Angeles County Museum of Art, Cambridge, 1990, 201–203, no. 53; 204-–206, no. 54. Although it is not known who commissioned these works, they were likely ordered by municipalities (probably, among them, Haarlem) that felt it was politically advisable to demonstrate support for the king and queen of Bohemia in their efforts to regain their realm. The king and queen had a close personal relationship to Prince Maurits, Frederick’s uncle. They were also beholden to him and the States General of the Netherlands for the military and financial backing they had already received for their cause, as well as for the generous way in which they had been welcomed in The Hague. In a courtly culture where gift-giving was a means of expressing gratitude for past support but also an accepted mode for strengthening bonds to ensure future backing, it is quite likely that Frederick and Elizabeth Stuart would have followed this tradition and honored Prince Maurits with a substantial gift in 1623 when there was such enthusiasm for them and optimism about their cause. What better gift for Maurits, who was intent upon raising the international reputation of his court, than a celebratory painting by a dynamic young Utrecht artist, just returned from Rome, who was greatly admired by the English ambassador in The Hague, Sir Dudley Carleton? Martin Royalton-Kisch, Adriaen van de Venne’s Album in the Department of Prints and Drawings in the British Museum, London, 1988, 96–97, 132, note 138; 178-–179, fol. 18. Although Royalton-Kisch only tentatively identifies this figure with the Winter King, the visual evidence that he is the Winter King is compelling. (see also 202–203, fol. 31, in which Frederick is identified positively) The game of balloon, moreover, had its origins in German courtly culture, where Frederick would have learned it and presumably brought it to the Dutch court. As with other games depicted in this manuscript, the game of balloon had allegorical implications related to the political issues of the day. Si par des bonnes loix sagement de manie. The Concert’s pictorial and iconographic associations with the Winter King make it quite plausible that he commissioned this work as a gift for Prince Maurits. The painting, which presumably hung prominently in the Stadhouderlijk Kwartier, would have provided a striking backdrop to the musical entertainment that Maurits so enjoyed, and would also have served as a constant reminder of the rightness of Frederick’s cause and the need to have Dutch support in his efforts to regain his realm. By 1632, when The Concert was listed as hanging over a fireplace in the centrally located groote bovensael in Prince Frederick Hendrick’s palace at Noordeinde, both Prince Maurits and King Frederick I of Bohemia had died, and while the political overtones of this work were no longer current, the painting’s compelling pictorial qualities endured. The musical ensemble was just as vivacious and enthusiastic as before, and the song had not lost its luster. Honthorst’s career, likewise, had not dimmed, and his fame had continued on its upward trajectory. By the late 1620s Honthorst had become actively engaged in painting for both the English and the Dutch courts, often painting portraits or portraits historié. In these portraits historié, nobility assumed pictorial guises, generally in the form of mythological, historical or Arcadian personages. To accommodate the large number of commissions he continued to receive, Honthorst established a large and productive workshop that remained active well past mid-century. However, in retrospect, the artist rarely again reached the artistic heights he achieved in this masterpiece of 1623. In The Concert Honthorst skillfully infused the artistic knowledge he had gained from his years in Rome with the energy and fresh vision of an artist at the height of his powers, knowing full well that success with this courtly commission would ensure a long and successful career. Probably Prince Frederick Hendrick of Orange [1584-1647], The Hague, by 1632; by descent to Prince Willem V of Orange [1748-1806], The Hague; requisitioned as a ‘spoil of war’ by the Revolutionary Government of France, and taken to Paris, May 1795. private collection, Paris and Senan, France, since 1840; purchased jointly 2009 by (Anthony Speelman, London) and (Adam Williams Fine Art, Ltd., New York); purchased 31 July 2013 by NGA. According to the inventory of the Stadhouderlijk Kwartier (the Stadholder’s official residence) made in August 1632: "In the Great Hall: (no. 611) A painting for the fireplace mantle made by Honthorst, being a Music." The inventory covers the collections of both the Prince of Orange and of his wife, Amalia van Solms. The painting was not inherited by (female) heirs of Amalia van Solms, which indicates that in 1632 it was owned by the Prince of Orange and later inherited in the male line. The Catalogus Kabinet van Schilderijen van Willem V op het Buitenhof (Catalog of the Gallery of Paintings of Prince Willem V of Orange), undated, but no later than 1793, includes: "(No. 65) A company making music, on canvas in [black frame with gilded inside edge] by Honthorst." Permanent French export license no. 111555, issued on 23 July 2009; copy in NGA curatorial files. The support is comprised of two pieces of coarse, plain-weave fabric that are sewn together vertically down the center of the composition. The fabric has been lined. Although there is cusping around all four edges, it is more prominent along the top, right, and bottom, indicating that the left side may have been trimmed slightly. The original tacking margins have been removed, but the x-radiographs reveal regularly spaced holes around the edges, which do not correspond to the cusping. This implies that at some point the edges were turned over to create a tacking margin, making the painting smaller, then subsequently opened up again to return the painting to its original dimensions. The current stretcher is slightly larger than the painting, extending the dimensions by approximately 0.5 cm on all sides. These areas have been covered with paper tape and inpainted to incorporate them into the design. The support was prepared with a tan ground. Honthorst applied the paint in a series of smoothly blended brushstrokes. He used glazes in the dark areas and slight impasto in the highlights. The x-radiographs and infrared reflectography do not show any artist’s changes, but examination of the surface reveals that the lute held by the figure in blue on the right has been enlarged. The painting’s texture has been compromised somewhat by the uneven application of the glue used in the lining, which has created a lumpy surface. The area along the seam is also slightly raised. The paint and ground are in fairly good condition. There is a large triangular area of loss that begins at the top of the purple hat of the center figure and extends to the left along the top of the painting. There is abrasion in the hair of the concert master and in his black cloak; in the hand, hair, and robe of the woman on the far right; and in the dark hat of the man in the right background. There is lighter abrasion scattered throughout the composition, though mostly in the darker portions. The painting was treated when it entered the collection in 2013. Drossaers, Sophie Wilhelmina Albertine, Cornelis Hofstede de Groot, and C.H. de Jonge. "Inventaris van de meubelen van het Stadhouderlijk kwartier met het Speelhuis en van het Huis in het Noordeinde te 's-Gravenhage." Oud Holland 47, no. 5 (1930): 231, no. 240. Drossaers, Sophie Wilhelmina Albertine, and Th. H. Lunsingh Scheurleer. Inventarissen van de inboedels in de verblijven van de Oranjes en daarmede gelijk te stellen stukken 1567-1795. 3 vols. The Hague, 1974-1976: 1:207, no. 611. "Art for the Nation: The Story of the Patrons' Permanent Fund." National Gallery of Art Bulletin, no. 53 (Fall 2015):33, repro. I am enormously grateful for the extensive research on this painting undertaken by Henriette Rahusen, Research Assistant in the Department of Northern Baroque Painting at the National Gallery of Art, which has provided me with an outstanding framework for writing this entry. This gesture, meaning “silence,” is illustrated in: John Bulwer, Chirologia: or the Natural Language of the Hand and Chironomia: or the Art of Manual Rhetoric, London, 1644, rev. ed., ed. James W. Cleary, Carbondale, 1974, 143, fig. H.
The date of Honthorst’s arrival in Italy is unknown, but it was certainly by 1616, when he made a drawn copy of Caravaggio’s Martyrdom of St Peter in the Cerasi Chapel of Santa Maria del Popolo, Rome. The drawing, in the National Gallery, Oslo, is illustrated in J. Richard Judson & Rudolf E.O. 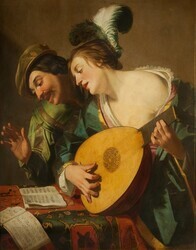 Ekkart, Gerrit van Honthorst 1592–1656, Doornspijk, 1999, pl. 395. Among the artists in Rome most inspired by Caravaggio at this time were Bartolomeo Manfredi, Orazio Gentileschi, Carlo Saraceni, and Valentin de Boulogne. A. R. Peltzer , ed., Joachim von Sandrarts Academie der Bau-, Bild- und Mahlerey-Künste von 1675. Leben der berühmten Maler, Bildhauer und Baumeister, Munich, 1925, 303. Honthorst probably would have received the invitation to live at the Palazzo Giustiniani from Benedetto Giustiniani, whose extensive collection included a large number of works by Caravaggio and the Carracci, as well as by Raphael, Giorgioni, and Titian. After his death in 1621, Benedetto’s younger brother, Vincenzo (1564-1637), who also lived in the Palazzo, inherited the property. It seems that other northern artists lived in the Palazzo, which was located near the Church of San Luigi dei Francesi. He would have seen this painting in the collection of Cardinal Francesco Maria del Monte. Honthorst’s classicism distinguishes his style from that of the other two major Caravaggist artists who flourished in Utrecht in the early-to-mid 1620s, Hendrick ter Brugghen (1588–1629) and Dirck van Baburen (c. 1594–1624), both of whom had been in Rome in the 1610s as well. W. Noël Sainsbury, ed., Original unpublished papers illustrative of the life of Sir Peter Paul Rubens, as an artist and a diplomatist. Preserved in H. M. State Paper Office. With an appendix of documents respecting the Arundelian collection; the Earl of Somerset's collection; the great Mantuan collection; the Duke of Buckingham ... etc., etc., etc.,London, 1859, 290–291. For Carleton, see: M. F. S. Hervey, The Life, Correspondence and Collections of Thomas Howard, Earl of Arundel, Cambridge 1921, 297. Carleton, as English Ambassador in Venice and in The Hague, actively sought to find paintings for Arundel’s collection. See: Robert Hill, “Sir Dudley Carleton and his relations with Dutch artists 1616–1632,” in Dutch and Flemish artist in Britain 1550-1800, Leids Kunsthistorisch Jaarboek, 13, 2003, 255–274. I would like to thank Stephen Ackert, head of the music department at the National Gallery of Art, and the Dutch musicologist Louis Peter Grijp, for helping identify these instruments, and discussing the nature of this musical ensemble. Grijp’s observations are contained in an e-mail he sent to the author on Nov. 20, 2014 (curatorial records). The bandora is a type of cittern. I would like to thank Jackie Taylor for sending me this image of the Whitaker painting, which measures 111.8 x 97.8 cm. This partial replica must have been executed in Honthorst’s workshop simultaneously with the Gallery’s painting. Louis Peter Grijp, “Conclusion and Perspectives,” in Edwin Buijsen and Louis Peter Grijp, eds., The Hoogsteder Exhibition of Music & Painting in the Golden Age (Exh. cat. Hoogsteder & Hoogsteder, The Hague; and Hessenhuis Museum, Antwerp), The Hague and Zwolle, 1994, 120. “Een Consert, van verscheide speelders en speelsters Leevens groote halverlijf op doek door G. Honthorst, 4 voet 5 duim 6 voet 5 duim.” Although the dimensions and proportions of the painting indicated in this inventory differ slightly from those of The Concert, there is little doubt that it is the painting in question. The Concert currently measures 123.5 x 205 cm, and the dimensions given in this document, when calculated in Rijnland feet (current at that time), would be 138.7 x 201.5 cm. Technical examinations of The Concert do not indicate that it has been cut at the top or bottom, but it is difficult to judge whether some trimming of the canvas support occurred in the past. In 1795 a French commission, under the leadership of the botanist André Thouin, decided which paintings to send to Paris take from the Netherlands. The list of paintings taken from the Galerie Willem V in The Hague appears in Beatrijs Brennikmeyer-de Rooy and Arthur Hartkamp, “Oranje’s erfgoed in het Mauritshuis,” Oud Holland, 102, no. 3 (1988), 181-233. The painting by Honthorst is no. 69 on the list. The information in the article is based on a copy of the list of all of the paintings, prints and books taken by the French from the Netherlands to Paris in 1795 and 1811 that was made by Baron A.J.C. Lampsins in March 1814. This document is in the Rijksarchief, The Hague, ARA, Archief Binnenlandse Zaken, Onderwijs, Kunsten en Wetenschappen 1815-1848, dossier no. 4019. S. W. A. Drossaers and Th. H. Lunsingh Scheurleer, ed., Inventarissen van de inboedels in de verblijven van de Oranjes en daarmede gelijk te stellen stukken, 1567-1795, 3 vols., The Hague, 1974–1976, 1 (Inventarissen Nassau-Oranje, 1567-1712) (inventory no. GS147), 207, no. 611. S. W. A. Drossaers and Th. H. Lunsingh Scheurleer, ed., Inventarissen van de inboedels in de verblijven van de Oranjes en daarmede gelijk te stellen stukken, 1567-1795, 3 vols., The Hague, 1974–1976, 1 (Inventarissen Nassau-Oranje, 1567–1712) (inventory no. GS147), 490, no. 170: [Huis in het Noordeinde (Oude Hof) 1702] “Een schilderij [doeck] voor de schoorsteen, zijnde musicanten van Honthorst.” [A painting [canvas] for the chimney, being musicians by Honthorst]. This painting hung on the lower level of the palace, in the “antechamber.” Two other inventories of the Oude Hof, one dated 1707 and the other, undated but post-1702, also mention the painting: GS147, p. 543 [Huis in het Noordeinde (Oude Hof) 1707] “Suyderquartier, (no. 3) Slaepcamer (Bedroom) Een Musijcq van Honthorst (A Music by Honthorst)”; and GS147, p. 547 [Huis in het Noordeinde (Oude Hof) (undated), na 1702 (after 1702), “(no. 4), Slaepcamer (Bedroom), Een Musijcq van Honthorst (A Music by Honthorst). Royal Picture Gallery Mauritshuis. Catalogue raisonné des tableaux et sculptures. The Hague, 1935, p. XVI, and footnote 2, nr. II: Catalogus van de schooner verzameling Schilderijen die zig in den Haag bevonden in de Galerij van den voormaligen Stad-houder Willem den vijfden Prins van Orange etc. etc. en die in Frankrijk getransporteerd zijn voor en door de Fransche Natie als gereekend zijnde te behooren onder de geconquesteerde goederen van dien Prins in Mey 1795, 8o , 36 pages, décrivant 191 tableaux sous 192 nos. (191 paintings under 192 numbers). Significantly, the French “unpacking” list of September 1795 only contains 185 paintings, a discrepancy of six paintings leaving The Hague but not arriving in Paris. See Tableaux du Stathouder apportés au Musée Central des Arts a Paris (Inventaire dressé par Le Brun et Mazade les 5, 6, 7 et 8 vendemiaire an IV) (= 27-30 Sept 1795) [Archives national. F. 17, 1276 (dossier no. 6) and F17/1277 “4eme envoie de la Haye”] published in: Ferdinand Boyer. “Une Conquete artistique de la Convention: Les Tableaux du Stathouder (1795)” in Bulletin de la Societé de l’Histoire de l’Art Français (annee 1970), (Paris, 1972) 149–157. Louis Gourajod. “La Révolution et les Musées Nationaux, Part II” in Révue des questions historiques 24 (Paris, 1878) 203. “[Alexandre Lenoir] trouvait exorbitant que la hautaine administration du Musée [des Arts] … s’arrogeât le droit de lui enlever les meilleures de ses pacifiques conquêtes, et même les objets précédement refusés ou dédaignés par elle.” I would like to thank Henriette Rahusen for this reference. Unfortunately, no inventory of Prince Maurits’ collection or estate has survived. In the 1620s, moreover, Maurits suffered from a number of military setbacks, a plot against his life, and deteriorating health, all of which hindered his attempt to raise the international reputation of his court. For an assessment of life at the court of Prince Maurits of Nassau, see, in particular, Kees Zandvliet, “Het hof van een dienaar met vorstelijke allure,” in Kees Zandvliet, Maurits Prins van Oranje, exh. cat., Rijksmuseum, Amsterdam, Zwolle, 2000, 37–63. Frederick Hendrick had a far greater interest in the arts than did Maurits, and, after he became Prince of Orange in 1625, he expanded the cultural character of the Dutch court, partly through the support of his consort Amalia van Solms (1602-1675) and the guidance of his secretary, Constantijn Huygens (1596-–1687). In 1630, Honthorst became the official court painter of the king and queen of Bohemia, and the exiled couple commissioned at least fifty-eight portraits of family members from the Utrecht master, who ended up opening a second studio in The Hague in order to keep up with the demand for his work. The States General allotted Frederick of Bohemia a monthly pension of 10,000 guilders and paid for the refurbishment of the Naaldwijk Hof, a home on the Kneuterkijk in The Hague, for the couple’s use (in addition, Elizabeth received a monthly stipend of 26,000 guilders from England). The house had previously belonged to Cornelius van der Mijle, the exiled son-in-law of Johan van Oldenbarneveldt, the senior statesman executed in 1619 after clashing with the politics of Prince Maurits and his supporters. The Winter King and Queen and their growing family would live there for nine years, followed by a move to a palace at Rhenen that the States of the province of Utrecht built on their behalf. This information is taken from Martin Royalton-Kisch, Adriaen van de Venne’s Album in the Department of Prints and Drawings in the British Museum, London, 1988, 23. Willem-Jan Hoogsteder, “De Schilderijen van Frederik and Elizabeth, Koning and Koningen van Bohemen,” Ph.D. diss., Kunsthistorisch Instituut der Rijks Universiteit te Utrecht, Utrecht, 1986, 99. In 1623, Protestant Union forces fighting on Frederick’s behalf during the Thirty Year’s War had little success against the army of the Catholic League. Nevertheless, in August of that year, King James I granted permission for the leader of the Protestant Union’s army (mercenaries paid with Dutch money) to raise 12,000 men in England, a positive development that Frederick hoped would have an impact on the balance of power. Unfortunately, that was not to be the case, and the political and military situation in Bohemia continued to worsen for the Protestants. Before Frederick was elected king of Bohemia in 1619, he was Frederick V, Elector Palatine (1610–1623). Frederick’s optimism about finding financial support for his military campaign is evident from his trip to Haarlem and Amsterdam in June of that year to try to raise funds for that purpose. For Vroom’s painting, see Jeroen Giltaij and Jan Kelch, Praise of Ships and the Sea: The Dutch Marine Painters of the 17th Century, exh. cat., Museum Boijmans Van Beuningen Rotterdam, and Staatliche Museen zu Berlin, Gent, 1996, 86–89, no. 4; for those of Willaerts and Van Wieringen, see: George S. Keyes, Mirror of Empire: Dutch Marine Art of the Seventeenth Century, exh. cat., The Minneapolis Institute of Arts, The Toledo Museum of Art, Los Angeles County Museum of Art, Cambridge, 1990, 201–203, no. 53; 204-–206, no. 54. Julius Wilhelm Zincgref, Emblematum Ethico-politicorum Centuria, pl. XCVII. Oppenheim, 1619.